Cuisine and Screen: NC Competition Dining : Cook Like a Chef! 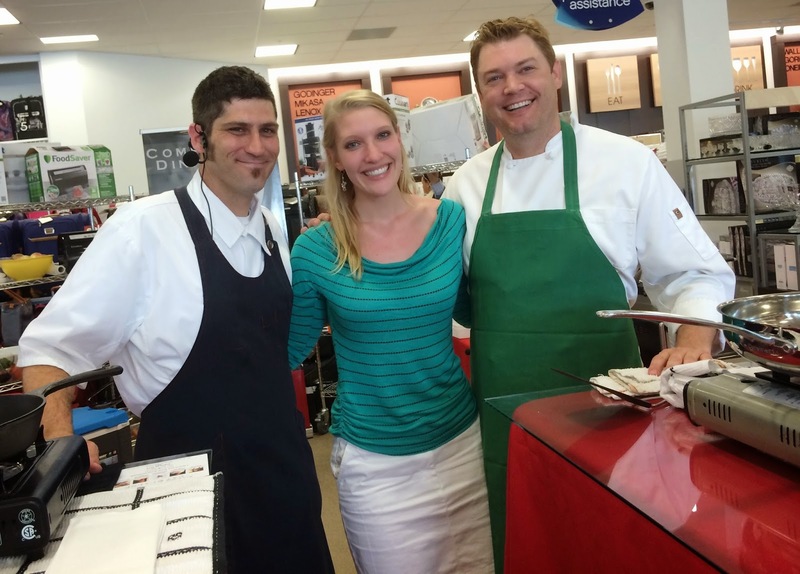 Kevin Reddick, the mastermind behind Artisan Restaurant in Winston-Salem, and Chris Russell (aka downtown Greensboro's steakhouse king) of B. Christopher's, put on a fantastic demo at the Got to be NC Competition Dining "Cook Like a Chef" event at the new Belk Home Store on Green Valley Road last Thursday. The store is crisp, clean and welcoming, with large windows to let in the bright sun. Displays are prominent - nothing is crowded, unlike several department stores I've been in. Salespeople are abundant, ready to tell you about the various juicers, chinaware and record players(!). The DJ cranked out some fabulous tunes, putting everyone in a good mood and ready to kick off the weekend. Chef Sandwich! Me, with Chef Kevin Reddick and Chef Chris Russell. What hunks! Earlier this year (April - June), Chefs Reddick and Russell competed in the Got to Be NC Competition Dining Series - Fire in the Triad (for which yours truly was a Guest Blogger!) Think Iron Chef, but YOU get to be the judge, and the chefs have to use a secret ingredient in each of their 3 courses! It's an absolutely awesome event. While the chefs were preparing their tasty dishes for the Belk shoppers, they told Fire in the Triad "war stories." Chef Reddick regaled us with his Buttered Pecan Syrup adventures, while Chef Russell described his experience cooking with Chestnut Flour for the first time. They made for an entertaining duo, while the fabulous Heidi Billotto played emcee. As for the food, both chefs presented a Crab Cake, and it's nearly impossible to call the winner. They were different enough to not be redundant, but both embodied what you want in a perfect summer bite. 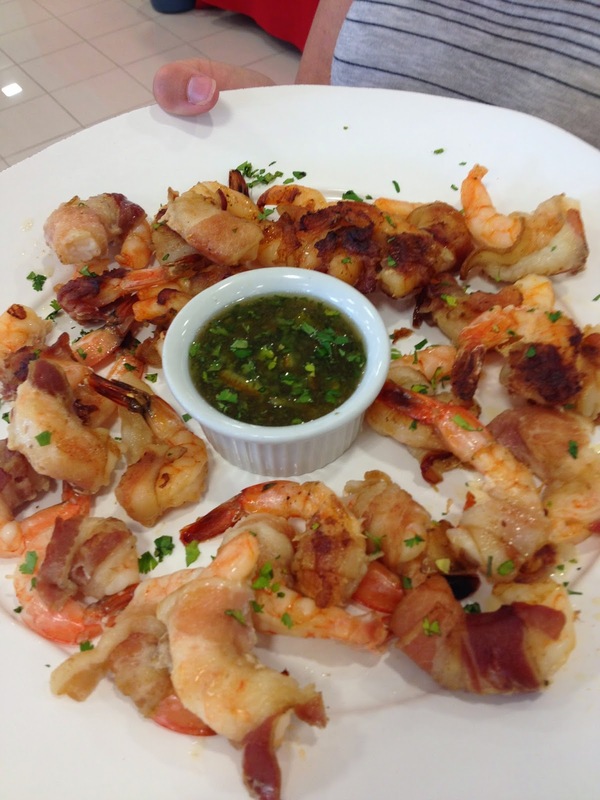 I could have eaten 50 of Chef Russell's Bacon-Wrapped Shrimp with Orange Cilantro Sauce. Using store-bought Orange Marmalade is a great short-cut for this sauce, a tasty complement to the scrumptious, salty protein. Chef Reddick's Grouper with Compressed Watermelon and Tomato was a generous serving (I didn't realize I'd practically have dinner here!) and cooked to perfection. I love the salty-sweet combo of fresh produce in the summer! Love my Got to Be NC swag! 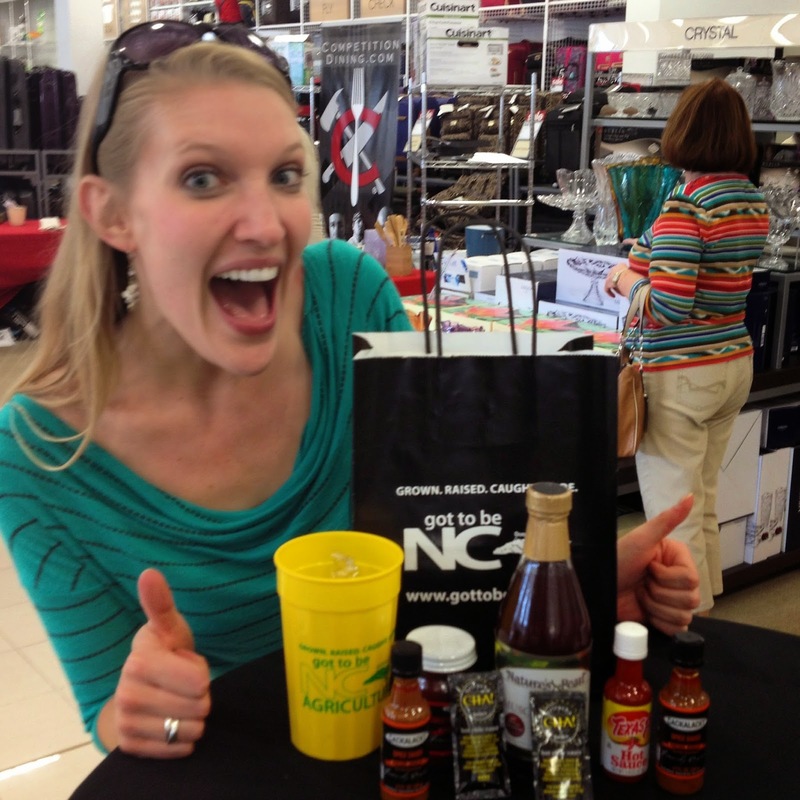 To top it all off, tons of prizes were given out, and I was lucky enough to win some "Got to Be NC" swag like Texas Pete 'Cha, Nature's Pearl Muscadine Juice and Cackalacky Sweet Cheerwine Sauce, among other delightful treats. Not only are Chefs Reddick and Russell two of the hottest chefs in the Triad (literally, just look at them! 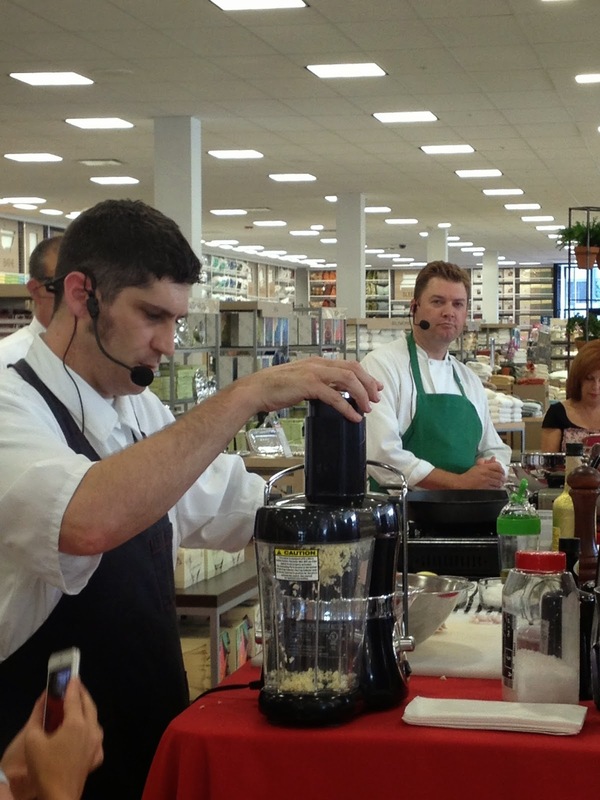 ), they served up some killer summer dishes and gave several good take-home tips (like using corn puree to make a healthier aioli!) I have a feeling I'll be a regular at the new Belk Home Store. I need to purchase a few things to help me cook like these guys.